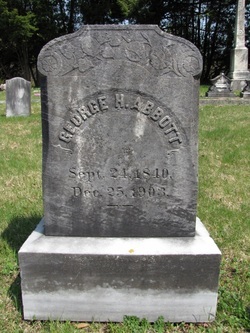 GEORGE H ABBOTT, the son of Walter and Esther (Pierce) Abbott, was born in South Berwick on 24 Sept. 1840. He died in Dover, NH on 25 Dec. 1903 at age 63 yrs, 3 mos, 1 day, a resident for 16 years (previously in South Berwick), and was buried in the family lot in Rollinsford, NH. He married first to SARAH HARVEY, by the time of 1860 census as it is noted "married within year". She died 12 June 1878 aged 39 years, 6 mos, and is buried in the Harvey Plot in South Berwick. She is very likely the daughter of Stephen and Mary Harvey. At some time before the 1880 census, George H moved up to Rome, Kennebec Co, ME and married secondly ELIZABETH A WILLIAMSON (born Mercer, ME 22 Mar 1857 to Samuel Williamson and Cordelia Welts, died 8 Jan. 1932 Concord, NH), but then moved to Dover, NH, where they are found in the 1900 census on First St.
A number of occupations are given him in sources, such as 'operative in mill', farmer + storekeeper, and nurse. At time of death, he was also the sexton for the Pierce Memorial Church in Dover, NH. His obit was carried in the Foster's Daily Democrat, dated 26 Dec. 1903. He was survived by a wife and daughter.